To start rounding your areas, open the document and choose "draw a line" function. Please do not use more than 30 dots for one zone. After zone is ready you can check its square/border length and color them in different colors. Before rounding particular territories we advise to check Google map markers. For example if you type Rochester International Airport, Google map will localize this address in the middle of Rochester airport runways. 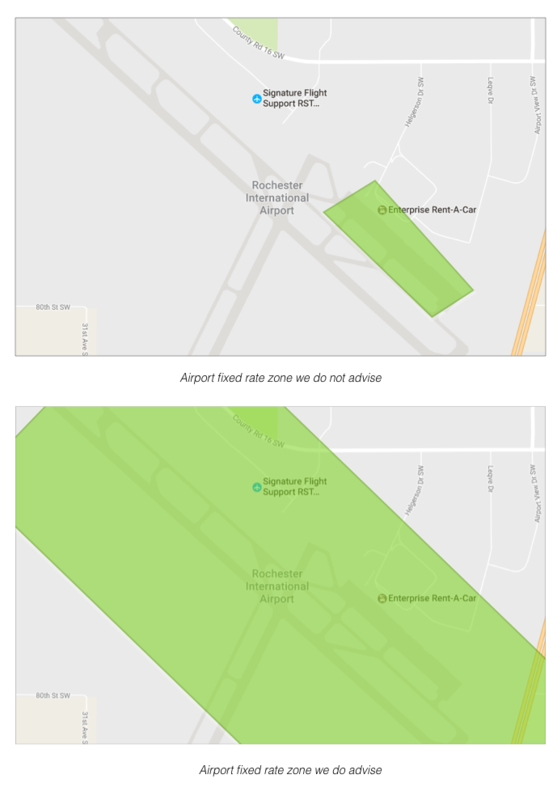 So in case airport runways are not included in the “Airport” zone and client types Rochester International Airport as the pick up/drop off location, he/she will be charged according to taximeter. We advise make zones slightly bigger and include surrounding areas in it. While setting particular zones it is important to not overlap neither leave extended spaces between them. In a given territory only one zone rate can have a priority, so basically overlappings does not make sense. However, it is possible to draw a full zone inside another one. It is convenient for price surcharge e.g. in the city center. As for the spaces between zones, we advise to make them the smallest. It prevents your passengers from the “gap” situations when being between zones a client can pay according to taximeter rate only. 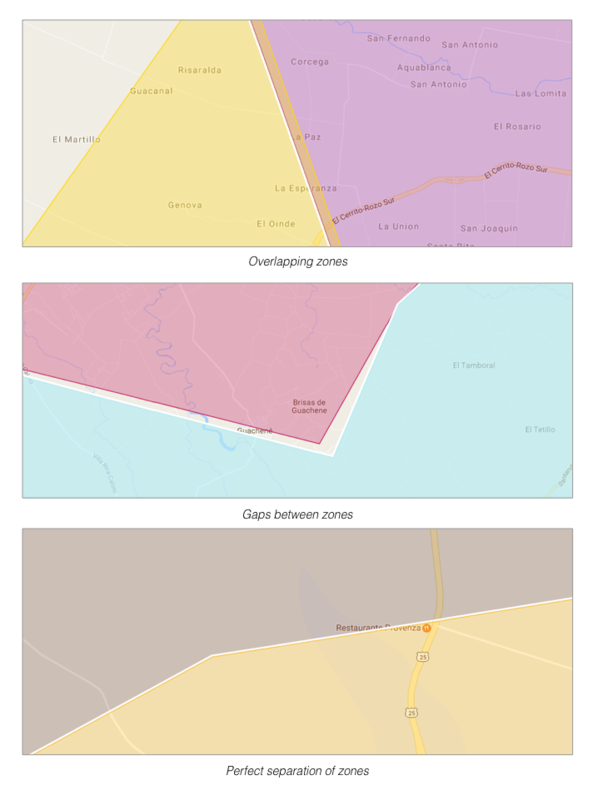 As you have seen already, while drawing on the map you will need to title each zone. So the names you provide in the pricing document should be the same. Remember that these titles will be shown to the passengers. So we advise to use commonly used names which are clear and understandable for the people of your city/town. In the sheet "Areas" insert vehicle types you have in the company panel. Please use default service names (ex: Classic) not the ones you have named you services by (ex: Airport transfer). Names of the zones should be identical with the names of the zones drown on the map. Once sheet "Areas" is ready, go to the "Fares". Here you can set prices for the trips between particular zones for each service type. Prices should be set in both directions, e.g. from City Center to the Airport and from the Airport to the City Center. In case one of the directions is not added to the list, the system will calculate price for such a ride according to the taximeter. Prices between the same zones but in different directions may vary (you can set 30 USD for a ride from the City Center to the Airport and 35 USD from the Airport to the City Center). Should you need to set a fixed price for rides within a given zone, put zone name in both columns of the pricing document, e.g. City Center and City Center. So in this case if pick up and drop off locations of the customer lie within this zone, the ride will cost 25 USD. Download your order report and choose trips with the most convenient pickup and dropoff locations. Verify if these points fit to your zones. Copy origin location (column I) and insert it into the search tab of your fixed rate zones map. Pick up location should be inside any of your zones. Copy dropoff location (column O) and insert it into the search tab of your fixed rate zones map. Dropoff location should be inside any of your zones. Please remember, that drop off location is required to make the system calculate the total according to fixed rate zones algorithm. So if K column of a trip in the report is blank, it means initially the client did not choose destination point so the system calculated the price according to taximeter. 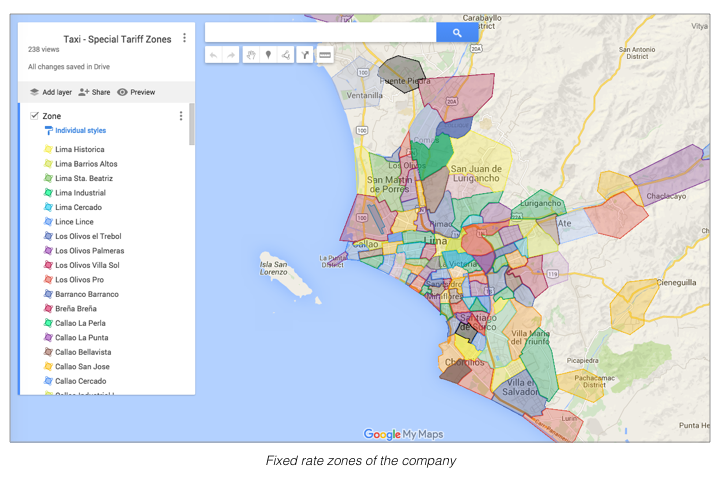 Do not forget to verify if all your zones are inside operational area of your company. Voila, everything is ready. Now drop us a message on support and we will make your configurations live.